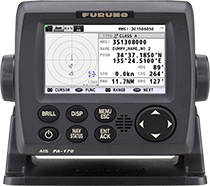 Furuno's FA170 is a Class A AIS Transponder with a 4.3" Color LCD Display. It displays symbols for AIS-equipped vessels, AIS-SART's, coastal stations and other aids to navigation within VHF range. AIS data can be output to ECDIS, Radar, or other navigational equipment for collision avoidance support. The FA170 includes 6 in/out ports, 3 input only ports, one LAN port, and one alarm output (contact closure) port. The unit is BAM (Bridge Alert Management) ready, meeting the specific requirements for BAM as specified in IMO MSC.302 (87). An optional Pilot Plug is available. This compact unit can store up to 2,048 AIS targets and AIS SART's. Selecting a target from the list generates a pop-up window where detailed information is displayed. You can also create an AIS message or send a name request to the target ship. When dangerous targets are detected, the FA170 provides a Dangerous Target list. The FA170 is also capable of exchanging short, safety-related messages with a specified MMSI or all AIS-equipped vessels via VHF channels. The FA170 can store up to 20 transmitted and 20 received messages. The GVA100/DB1 is a GPS/VHF combination antenna with DB1 Junction Box. This product does not include the required VHF antenna. A UAIS rated VHF Antenna is a required option - use FAB-151D or purchase locally.